It’s important to be prepared when you’re out cycling, and if you’re exploring rugged trails then mountain bike clothing is a must. With so much choice, we present some of our favourite women’s kit on the market. Wearing a standard t-shirt is fine, until they get wet from rain or sweat, and cling to your body. Getting a biker specific top will fit better and being made of synthetic fibres, it also wicks away moisture better. 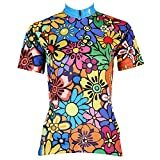 Mountain bike jerseys are similar to road bike versions. They are a little less close fitting, to allow movement on the bike; you need to be able to stretch upwards without the sleeves ending up round your armpits, and bend over without the back riding up leaving you with a cold midriff. Having a rear pocket is handy to keep snacks, keys and tools, especially if you don’t use a rucksack. A ventilating front zip is nice to have when you’re getting hot pushing the pace or climbing. You will want different tops for different weather. 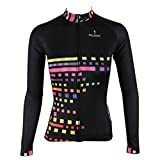 A jersey like the short sleeve Santic cycling jersey for women will keep the chill off in spring and summer. 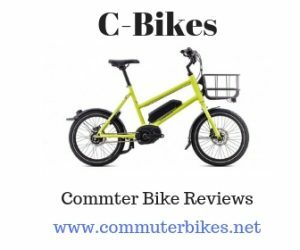 The cycling jersey is breathable, high viz and has lots of good reviews. Check the link below for sizes. However in winter you will want a warmer full sleeve jersey. We recommended KMfeel long sleeve Jersey, which has a front zipper, colourful style and breathable. If you are looking for something very colourful, try the flower print also by KMfeel. Lycra road race shorts certainly aren’t the right look for the mountain biking enthusiast. You need extra freedom of movement and hard wearing material that will withstand whatever you throw at it. 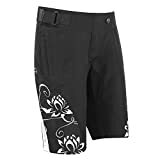 Mountain bike shorts offer stretch for easy leg movement and a thinner padded crotch liner (because you sit more upright and your riding position continually varies between seated and standing). You will want plenty of pockets too. Most liners are removable, however some shorts have it fully integrated. The Tenn Ladies Burn offers excellent value for money, and a great choice for first pair of shorts. Neoprene panels ensure a wide range of movement, and it features two deep zip pockets. These shorts do not come with a padded liner. This would be suitable for down hilling or shorter rides. The Madison Trail is a little more expensive, and had 5 zip pockets, a built in belt to get the perfect fit around your waist, and a removable liner short with their 2D coolmax chamois pad. This is perfect for longer rides and days climbing in the saddle. A well-fitting waterproof jacket is essential for any mountain biker. You will want a cycle specific design, and not just an outdoor jacket; A cycling jacket will be tighter to offer better wind protection front on and will be tailored to provide comfort through the shoulders and arms when you lean forward in the saddle. A hood can be useful but can be a pain if they don’t stow away or aren’t removable. The hood should be helmet-compatible, meaning it can fit under a helmet. For serious protection, a waterproof/breathable hardshell jacket is a must. For short rides and moderately gloomy weather, some riders take a featherweight jacket that packs small enough to fit in a jersey pocket. For a packable waterproof jacket, that won’t break your bank account, you won’t go too far wrong with the Altura Nevis II; Altura is a firm favourite for many cyclists, and their jackets have been proven on trails up and down Britain. This jacket is completely waterproof, including a waterproof pocket, to keep your valuables dry. If you want a thicker jacket with a hood, for those wetter months, the Madison Leia is recommended. While waterproof, it is also fully breathable, and has mesh openings, meaning your sweat will wick away. The hood fits under your helmet, and single hand operated draw cords are easy to use while on the move. Not all mountain bikers wear gloves but it’s a good idea if you are starting out because of the high likelihood of crashing. They also help reduce soreness caused by vibrations from riding. You can get fingerless mitts for the summer but for winter riding you’ll find full gloves are necessity to keep your hands dry and warm. In fact many cyclist use full finger gloves all year round as they give better protection. Because grips are padded on a mountain bike, having padding in gloves is not essential unless you go for long rides. Less padding means you have a better ‘feel’ for the bike too. Having some grip on the palm is a good idea though as it helps stop you slipping off the bars mid jump or descent. Freemaster full finger cycling gloves are an excellent all rounder. 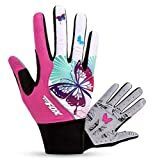 These have great durability from the synthetic fabric construction and protection from reinforced fingertips and a crash pad. 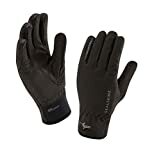 For fully waterproof gloves look no further than Sealskinz and their Sealskinz Sea Leopard gloves; lightweight and 100% waterproof, they include a technical moisture management liner to keep hands dry and warm. Socks are important for the same reason that gloves are – they help protect your feet from getting cold, wet and sore. Bike-specific ones will generally have padding in the right places and be made of breathable materials that help carry moisture away from your skin. Some are even waterproof, so you can wade through a stream and still have dry feet. 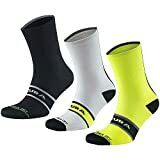 Altura Dry Elite Thermolite socks are a great pair to start out with. They have dual heal and toe construction for comfort and wick sweat away with Altura’s Dry technology. 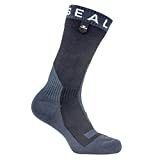 A Set of waterproof SealSkinz socks are simply incredible. They use a liner to prevent water getting in, which means that splashes from puddles and wheel spray doesn’t instantly leave you with cold, wet feet. While water can still get in over the top of the sock and shoe, they’re still great for those foot in the puddle moments.